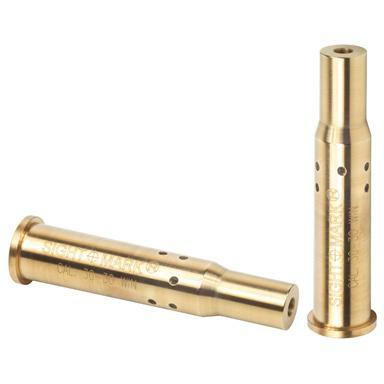 Sightmark® .30-30 Premium Laser Boresight. Save ammo, same time at the range, save weapon wear. Get things into alignment, without firing a single shot! Just chamber this Boresight like a regular bullet, and a laser dot shows exactly where you're aiming! Then just adjust your sights or scope, and save your extra ammo for the hunt. Includes carry case and battery pack. Sightmark .30-30 Premium Laser Boresight is rated 3.6 out of 5 by 5. Rated 1 out of 5 by Dan Schumacher from DOA Was DOA. A 9mm version ordered at the same time worked fine. Rated 3 out of 5 by HAMMER from sightmark 30-30 Started to use it on a dark cloudy day. I was able to see the laser on a large piece of cardboard at 50 yards. The one I bought must have been sitting on a shelf for years because the light started dimming within a few minutes and worthless in 15-20 minutes I'll have to go to the store to get more batteries and try again.. Train anywhere, without firing a shot.